40+ Years experience waterproofing homes and residences. We use the best of methods and offer lifetime transferable warranty on our work. basement and crawl space waterproofing. If you’re in Greensboro & you think you may need waterproofing, this is the place to be: AquaDry Waterproofing provides specialty services in Charlotte & Greensboro NC and the entire surrounding area. If you need Charlotte or Greensboro Waterproofing services, this is the place to be. There is only one way to permanently fix the problem of water in your basement and that is a footing drain. You can put the drain on the inside or the outside, the water doesn’t care which side of the footing you collect it from just so you collect it and pipe it away. It is usually much less expensive to put the drain on the inside than to excavate your property because when you excavate you must clean off all old waterproofing and redo the walls as well as install the drain, this is very time consuming and costs a lot of extra labor as well as materials. You will usually lose all your landscaping and plants when you do it from the outside. To determine if a wall needs waterproofing is easy on unfinished brick or concrete block, sometimes your walls are holding water and there is no evidence other than a musty smell in your basement, or a problem with mold and mildew growing back too fast in any part of your house. All you need to do is run your hand firmly across the wall preferably near the bottom portion of the wall, then look at your hand. If there is a powdery residue on your hand that is alkaline, a chemical reaction that happens when water sits inside of concrete. 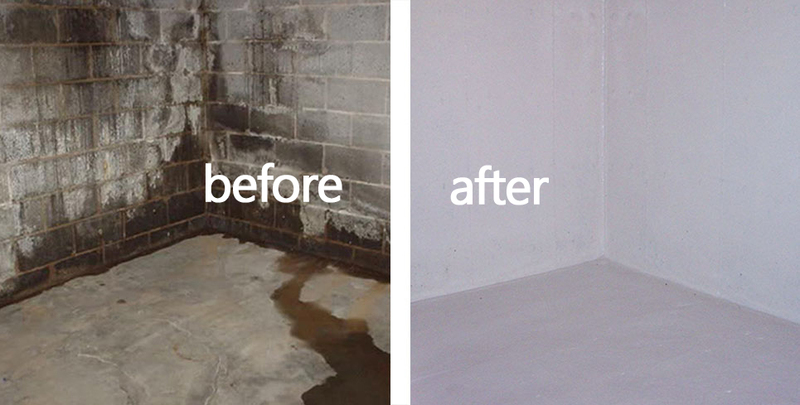 Alkaline on your wall is the first sign of your concrete deteriorating. When you waterproof from the inside you must remove the slab a foot from the wall the entire length of the outside wall on which the water is evident., if it is in a corner it is best to do both walls. Then you must dig out all the dirt and debris all the way down to the bottom of the footer and throw it away. As you dig the trench you must terrace or slope it, all trenches going down hill until the lowest point, (water doesn’t run on a flat surface) insert a drain pipe. Now you will need to drill half inch holes in each of the cinder block cavities, not only to allow any water that is in the wall to run into the system but also to collect any surface or roof water coming through old worn out waterproofing on the outside of the wall. Remember water coming through will not hurt anything but standing water will destroy your home. Also water that is not collected and piped away will never dry out completely; that may result in mold, mildew, and structural settlement issues. You would then fill your trench up with gravel, to sift out any foreign matter that may clog your pipe and also to support the new concrete you will pour. Now you must connect your pipe into an outside drain or collect it in a 30-gallon well with sump pump. 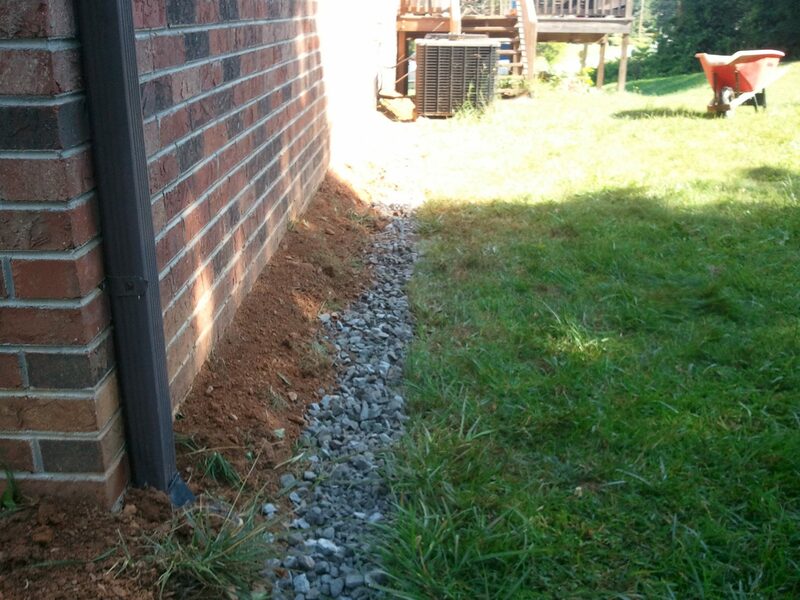 After your gravel is in place you should put a flashing just below baseboard height and fold the remainder over the gravel this will collect any sweat that may occur later on your wall… now you are ready to pour new concrete and close up your trench. A footing drain installed in this manner will never get clogged, collapse, or wear out. You may now finish your basement and create much more usable footage greatly increasing the value of your home. That’s why our lifetime transferable warranty is the best kind of warranty, the one you’ll never need to use! Need a permanent basement drainage solution? 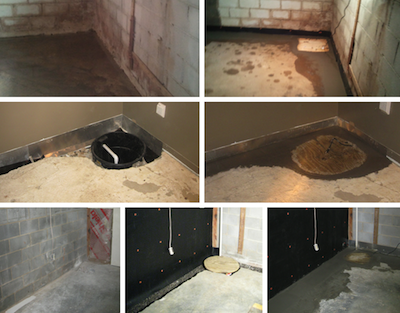 Let our team provide permanent basement drainage for your leaky basement. Get an affordable solution to basement drainage by investing in an interior or exterior foot drain. Interior drains are less expensive and offer faster solutions to drainage problems. That musty smell in your basement will be a distant memory after our reliable drainage work. Expect outstanding customer service from start to finish. Call us now and get a FREE estimate on basement drainage. Not only do you get exceptional workmanship, but you’ll also get our transferable lifetime warranty. Permanently Fix Your Leaking Crawl Space. Dry solutions for your crawl space. Not sure if you need Crawl Space Waterproofing? You may not see crawl space water concerns easily. To determine if you need waterproofing, examine the area where the walls meet the dirt with a high-powered flashlight. Look for white marks climbing up the blocks or moisture marks. Then trust our exceptional workmanship to resolve it. To determine if your crawl space needs waterproofing, look at the walls where they meet the dirt with a high-powered flashlight. If you see moisture marks or white marks climbing up the blocks, you have water standing around your foundation walls. When we waterproof from the inside, we will need to dig the dirt away from the wall all the way down to the footing. Then dig a trench in front of the footing on a natural slope. Then install a drain pipe covered with filter sock so the system will always flow freely into pipe discharged outside away from home or into 30 gallon collection well and sump pump to be piped outside away from home. You’ll get a lifetime, transferable warranty with our service. Get fast, reliable service. Call us for a crawl space waterproofing FREE quote. Work closely with our team. You’ll get a customized solution that works for your specific needs. Expect 100% customer satisfaction. Do You have standing water in your yard? Get comprehensive service for all surface drainage needs. Standing water is dangerous, not only for your health, but also because it can erode away the foundation of your home. Let our licensed and trained team get to work for you finding the ideal solution for surface drainage. Stop those basement floods and foundation risks. Our superior workmanship makes all of the difference in your results. Get fast, reliable results. Call us for a FREE estimate on drainage solutions. Don’t put it off. You’ll get a lifetime transferable warranty from us.